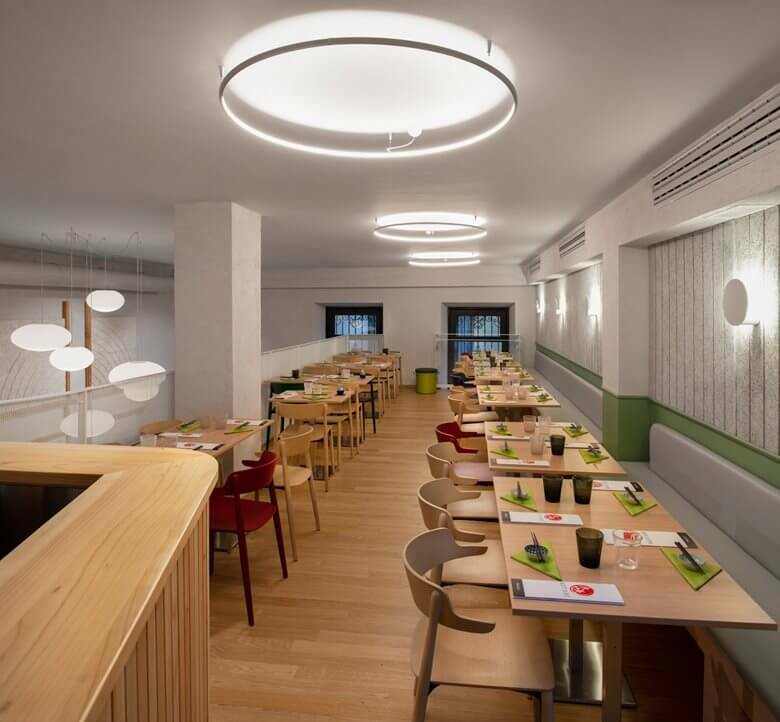 Italian architect davide beretta design the Japanese restaurant at milan,Italy. Miyabi Milano is the Japanese and Italian mixed name. 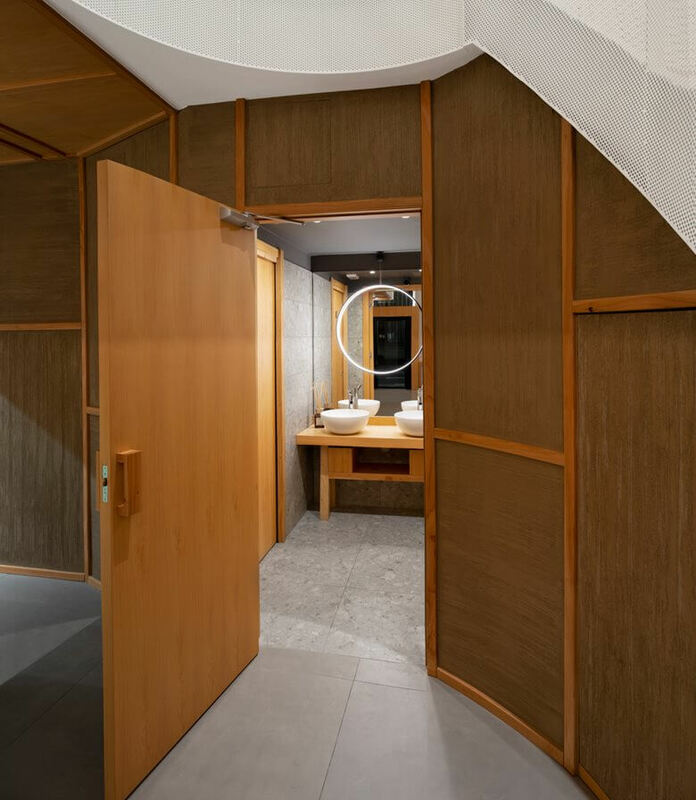 Davide beretta design does it Light, cypress wood, Uglass and perforated sheet are the elements which characterize my project of Miyabi Japanese restaurant. 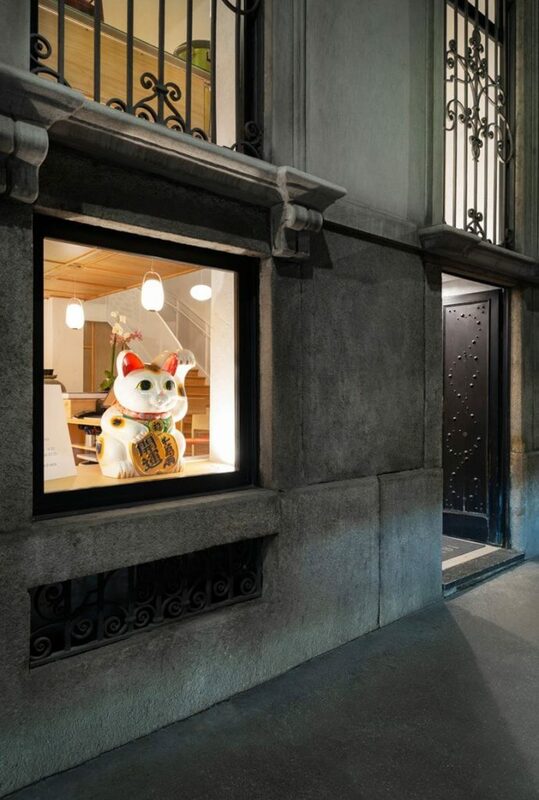 Miyabi restaurant occupies the ground floor premises of a prestigious historic building in the centre of Milan, A restaurant are few far from Duomo and San Babila’s Basilica. 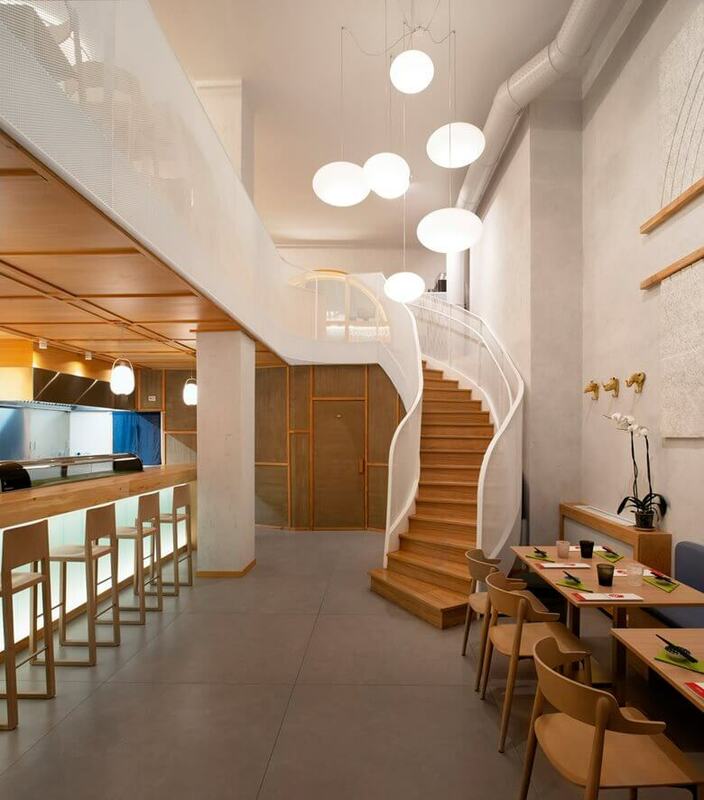 Restaurant owners’ oriental philosophy is Miyabi Restaurant Interior is a bright and minimal space. 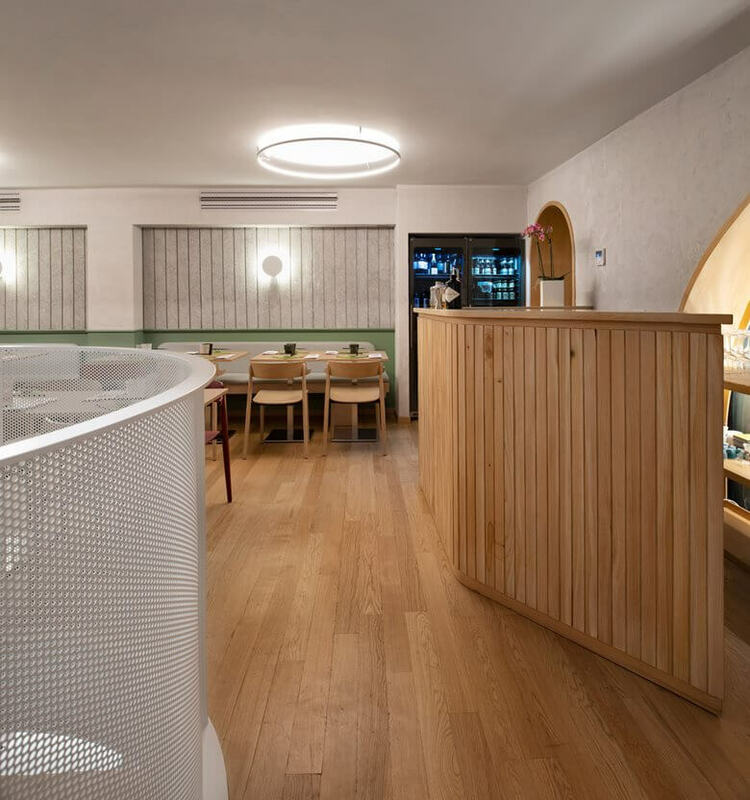 Architect DAVIDE design resturant the simple and clean lines define the space while the wide use of natural materials, such as cypress wood, help to create a more intimate atmosphere. 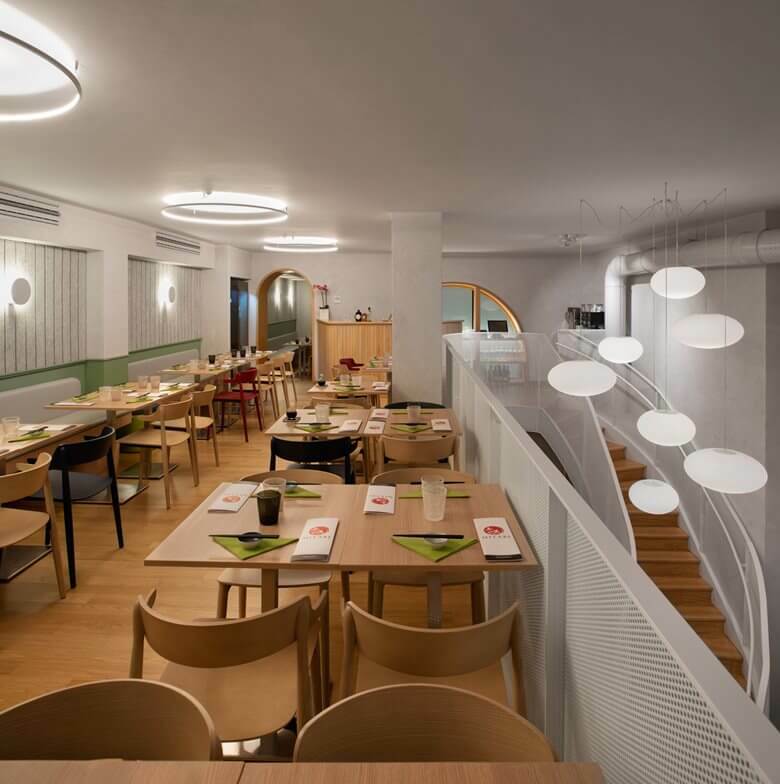 The restaurant occupies a large rectangular room, almost six meters high and half-loft, punctuated by large floor-to-ceiling windows overlooking Corso Monforte, which allow for great natural lighting during the daytime. Architect design the above wooden staircase design which is for widely curved wooden staircase connects the two levels of the room. The white perforated metal sheets of the railing follow the curves of the staircase, defining the loft area through a curious game of transparencies. 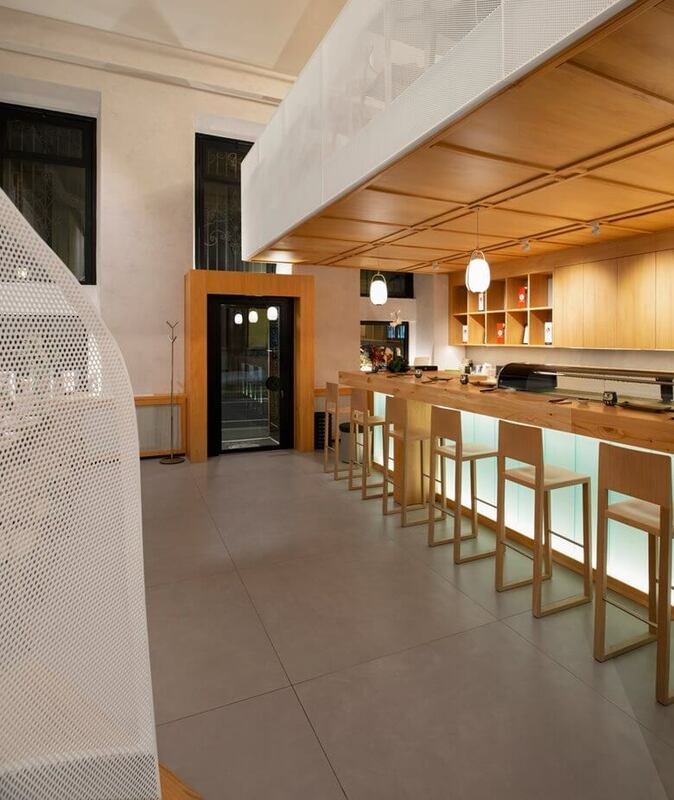 A 7-meter monolithic counter distinguishes the space by dividing Chef Iko’s operating area from the rest of the room. Chef Iko’s are handeling the whole food which is served in a restaurant. 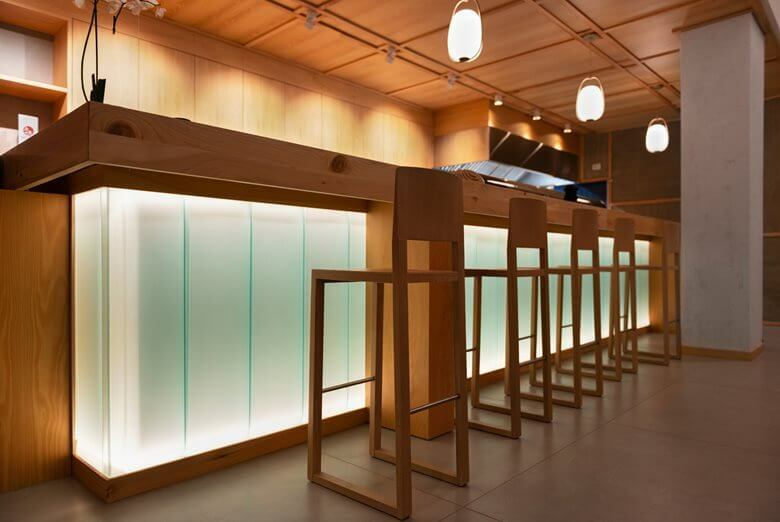 The large counter is made of a long, solid cypress wood top and a frosted and backlit U-glass panel series. In spite of its impressive dimension, backlit glass help to make the bar counter appear lighter as if suspended in ethereal and abstract space. 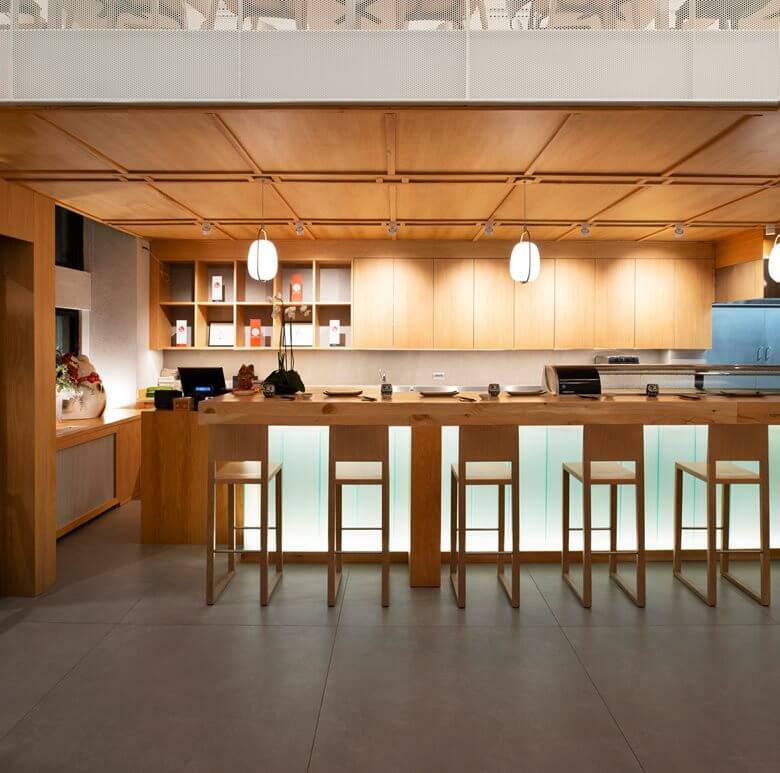 Positioned directly above the counter, the wooden staves of the suspended ceiling complement one another with geometric patterns and lights which have been precisely embedded. A Magis Mini’s spotlight series illuminates the back counter, while the light of the four Kundalini’s Lannà’s elegant pendant lamps descends on the counter, creating a more intimate atmosphere. The room’s flooring is made of Casamood porcelain stoneware cement effect by Florim (120x120cm). 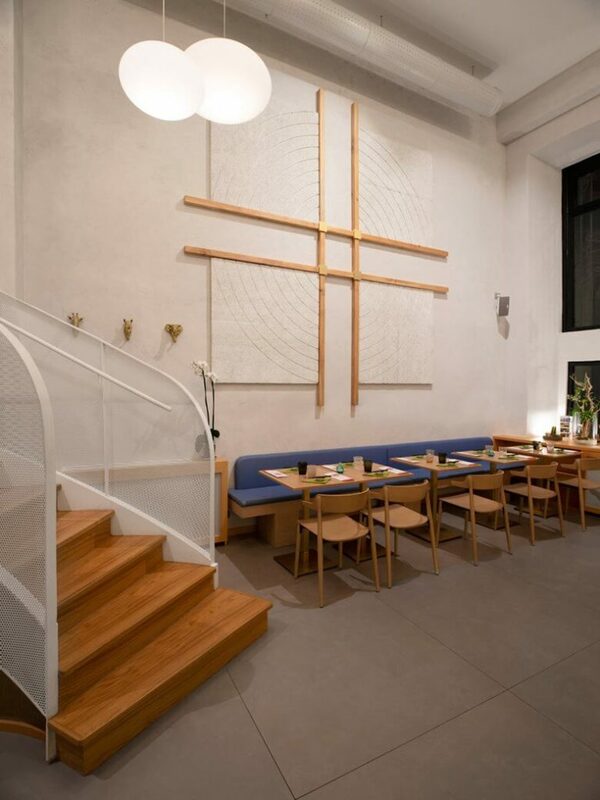 In a restaurant wall a large installation overlooks the five tables on the ground floor. 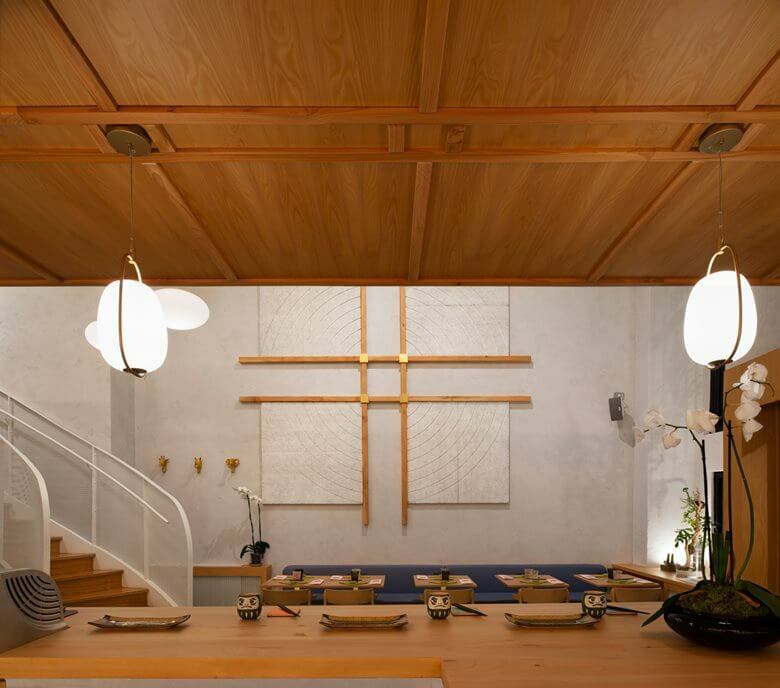 A wooden cross with golden details at its intersections frames four large Celenit’s panels with special concentric circles, dually functioning to absorb sound and to amplify the aesthetic quality of the room. The predominance of wood on the mezzanine floor helps to establish a cozy and intimate atmosphere which lends itself to the casual enjoyment of the customers. 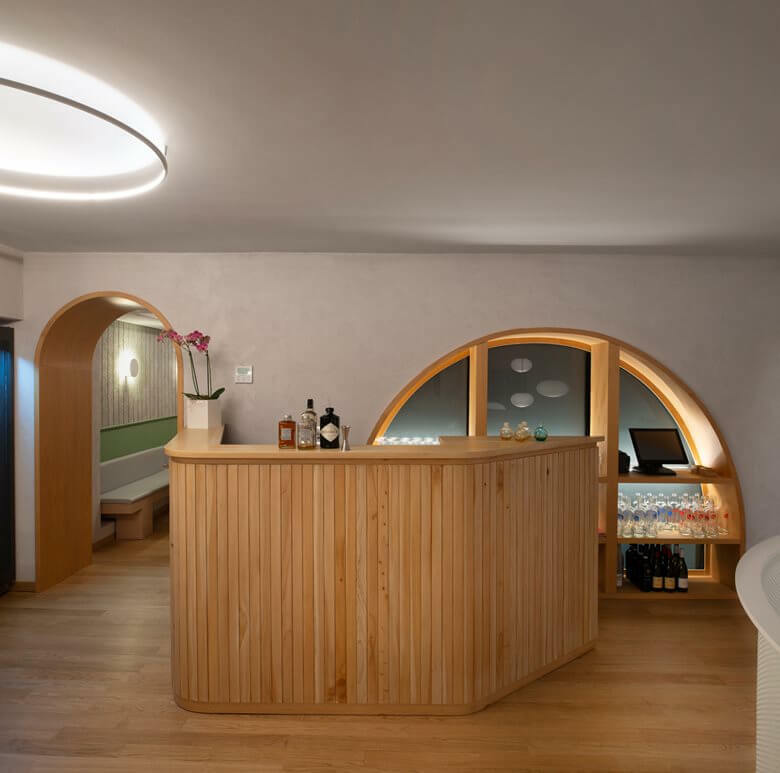 The parquet flooring, Nemea chairs, Pedrali tables, bench structures and the bar counter are all made of wood, as well as the two large arches that characterize the mezzanine; the first frames the opening between the loft room and another more reserved room, while the second frames the large glass window behind the bar counter. The lower half of the main mezzanine wall is covered with light green boiserie, while the upper half is covered by Celenit’s sound-absorbing panels. The particular slatted processing of these panels makes the material, in effect, an element of decor in addition to its functionality. Additionally, there are Collide H0 wall lamps by Rotaliana placed upon the same wall. A large chandelier, Oh Smash! 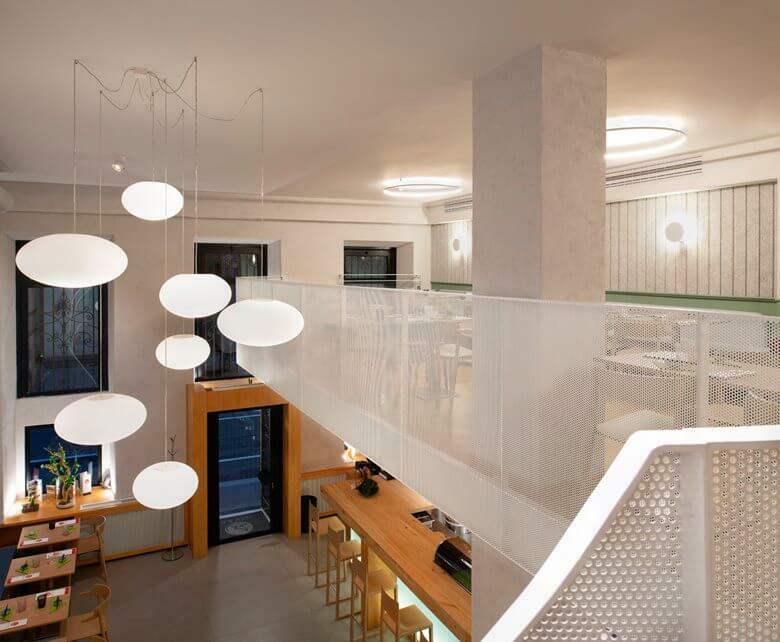 by Linealight, composed of seven opalescent spheres, hangs at two separate heights.